Discounts are one of the most effective ways to attract and retain customers. To gain credibility among its customers and operate stably working enterprise, discounts should be clear and understandable structure. SoftKB recommended for transparent pricing policy, a clear control over profits, use five reference price of the item cards. For each reference price indicates the desired percentage discounts. Each customer can be attributed to one of the 5 categories. Each category corresponds to a particular column matches. Columns matches can be called in an arbitrary manner in the system settings in the section "Prices". What are the benefits we get, using a clear step-system of the five prices for price list? pricing as simple and understandable. A discount is easy to track and monitor. For products with high mark-up the price difference from first to last praysovoy column may be greater than for products with low margins. In fact, we form a system of discounts at the level of each product individually. What prevents the risks of sales with low profitability. For those users who are not satisfied with the speed system of discounts to customers in the columns referenced Preiss, TCU provides a range of more flexible instruments. Starting with version 3.45, the TCU provides for a system of cumulative discounts. Discount buyer is determined depending on the amount of shopping for a certain period of time. Implemented the system on the basis of rules that are specified in the customer's card. If necessary, the rules can change, if change the terms of trade. Using a system of cumulative discounts, it is advisable to use the discount cards. First, it is a convenient tool for identification. At a discount card is applied individual customer number in the form of a bar code, which is included in the customer card. The client comes with the card, using a scanner reads the bar code, and the program automatically calculates the discount depending on the amount accumulated by the client. Secondly, getting a discount card, the customer is interested to purchases in the store, to earn a higher percentage of discounts on future purchases. 3% discount in the exercise of purchase in the amount of 500 UAH. for a period of 30 days. 5% discount for the implementation of the purchase in the amount of UAH 1000. period of 60 days. discount of 7% in the exercise of purchase in the amount of UAH 1500. period of 90 days. 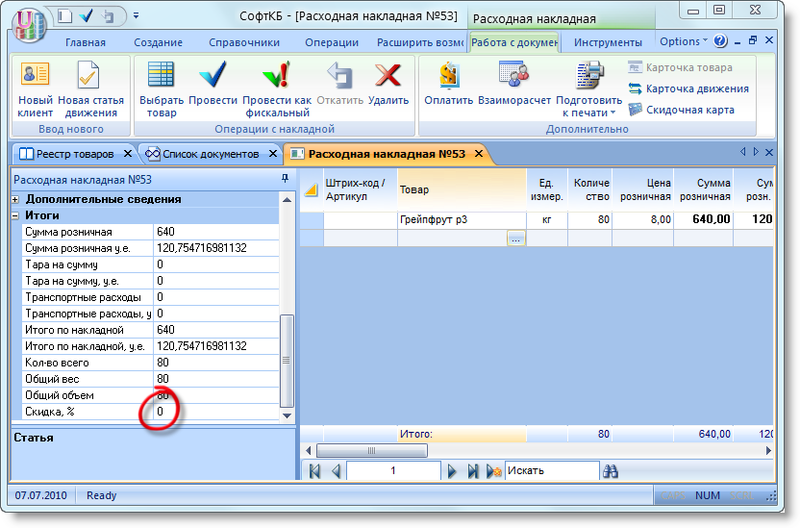 Open client card, the tab "Data for the calculations. To assign this client a discount, check the box "discount is activated. Specify the number of discount card customer. Define what the discount will be assigned to this client. In the field "type discounts" from the dropdown menu select "Cumulative Discount". 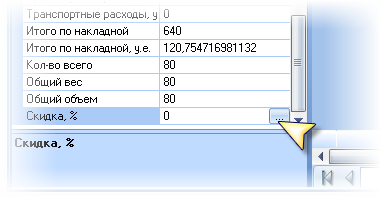 The following window appears, where to enter data to calculate the discount. 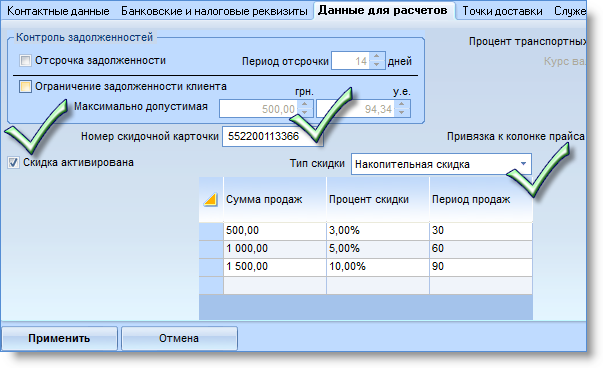 When a purchase is made, the system automatically calculates the amount of those purchases for each of the imposed rules. If the purchase amount satisfies the rule, the system provides a percentage discount. There may be a situation where admissible will be several rules. In this case, will choose the rule which gives the highest percentage discounts. Create the Sales Invoice. Note the field "Discount,%". 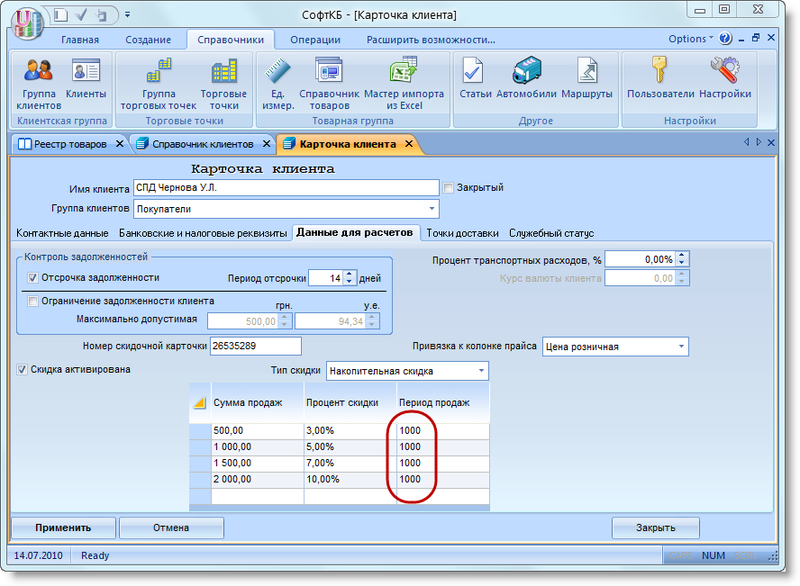 The percentage discount is equal to zero, despite the fact that the bill is executed first condition discount. There are currently specified discount, valid on previous purchases. In our case, the client carried out his first purchase, respectively, and the percentage of discount is zero (the sum of previous purchases is equal to 0). In order to determine the discount takes into account the current purchase, you must click on the button "..." in the field "Discount, %». Using this mechanism, you can choose whether to include the amount of current purchases in the amount of accumulation for the calculation of the current discounts. You can assign an environment in which the discount will depend only on the purchase price and not depend on the time at which the evidence is perfect purchase. This field shall indicate the period sufficiently long time calculating the amount of purchases, for example, 1000 days. If you want to set an overall discount for the client to the whole range of goods, regardless of purchase amount, using a fixed discount. 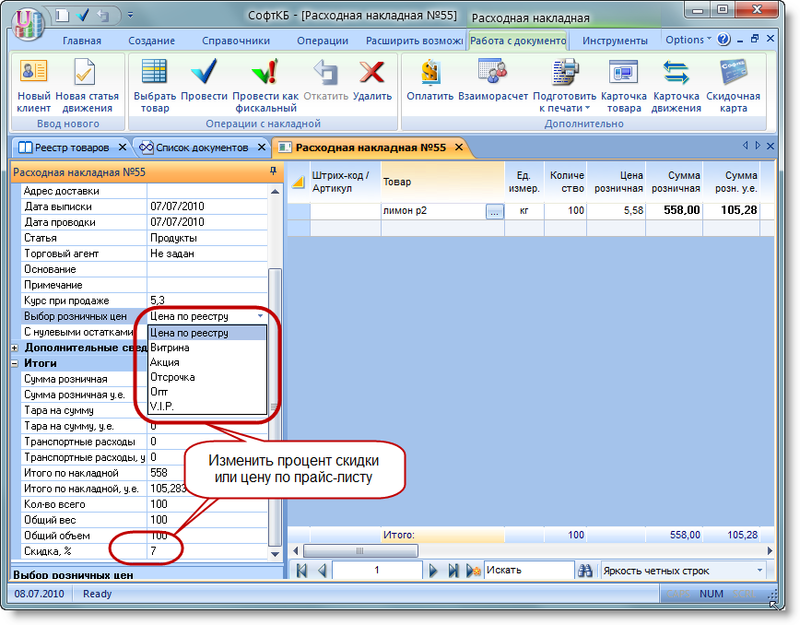 In the field "type discounts" from the dropdown list choose "Fixed Discount". Specify the discount that you intend to provide. The above discounts apply to long-term discounts, ie validity of which extends over a fairly long period (eg one year). Individual discounts are generally used as a tool for solving certain problems. For example, to realize stale goods or to attract customers' attention to a new product. This also can be attributed, and seasonal sales. To implement this type of discounts you can use all the same listing. It is convenient that the discount can be set individually for each item, and only for certain products. After all, for different product might be different percentage discounts. given the name "Action" ("sale", "Opt", etc.) one of the reference price. 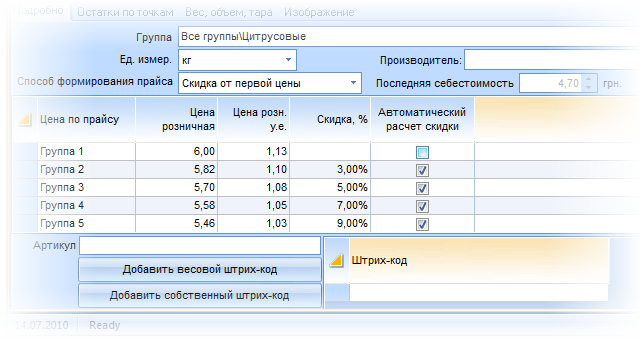 Determine the percentage discount in the price band for the required goods, works on automatics. 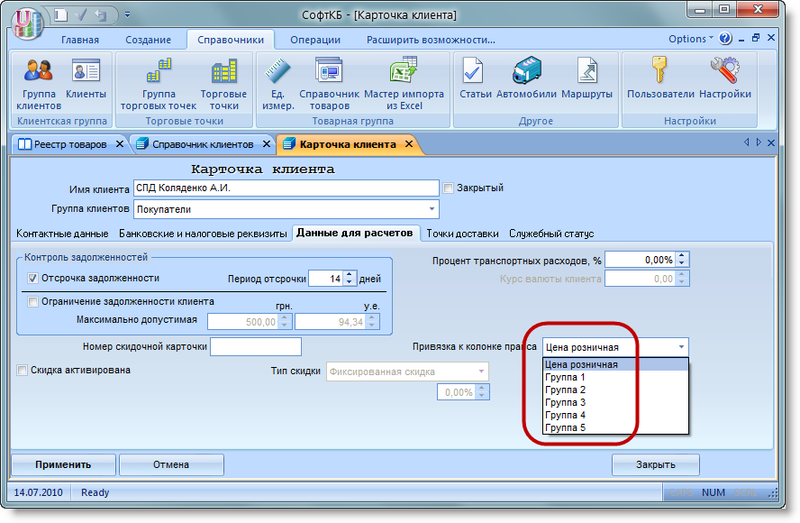 TCU Report Wizard allows you to print price tags with the old and the new price, and indicate the percentage discount. It is convenient because the buyer can immediately see how many saves. more about how to set commodity discount is available by contacting link. You can use a combined discount. 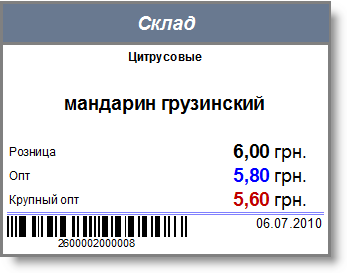 For example, a customer who participates in a program of cumulative discounts can determine bind to one of praysovyh prices. Similarly, we can combine and a fixed discount to the reference price. This arrangement gives the opportunity to provide additional discounts to some customers. worth noting one important point. When changes are made on the lower level (in this case bill), installed on the upper level (directory) remain unchanged. It may happen that, for whatever reasons must be one-time change the percentage discount or not to grant it at all. In this case discount will automatically outstretched from the customer's card or a product, you can manually change directly in the expenditure bill. Just as necessary prices in this bill can be bound to another column Price. apply or not apply the discount? If applied, what is it? Answers to these questions are ambiguous. It all depends on the conditions of competition, from the purpose for which the company plans to offer discounts. TCU provides a flexible tool to build your coupon policy. It is important that the use of discounts there a clear procedure for how to define their values and conditions, and to persons authorized to offer discounts. With proper and rational pricing, discounts will maintain a constant and growing interest of clients. This will bring benefits in monetary terms, but also enhance the prestige and competitiveness of your company as a whole.